Malaysia Airlines MH370 vanished in March last year, shortly after departing from Kuala Lumpur en route to Beijing. Efforts to find the plane have turned up nothing so far, and the fate of the Boeing 777 and its passengers is unknown. One of the aviation experts consulted by CNN during the MH370 coverage has now claimed that Russia hijacked the plane. In a lengthy feature for New York magazine, Jeff Wise proposed a theory that MH370 was hijacked by Vladimir Putin (who else?) and landed at the “slowly crumbling” Baikonur Spaceport. @yurybarmin@NYMag Ok can Borat then fly MH370 to its final destination to solve the problem? Except Baikonur isn’t some sort of secret Area 51 facility; all manned space flights to the International Space Station (ISS) take off from there. In fact, the first part of Expedition 40 to the ISS took off from Baikonur on March 25, 2014. Wise admitted he had no idea what the possible motive for such a heist could have been, but said in the article that Russia was a “paranoid fantasist’s dream” and that, when he heard about the Russians being suspected in the destruction of MH17, it “seemed so perfectly to tie the bow” on this construction. However implausible or downright insane his theory seems, he is perfectly certain of it. 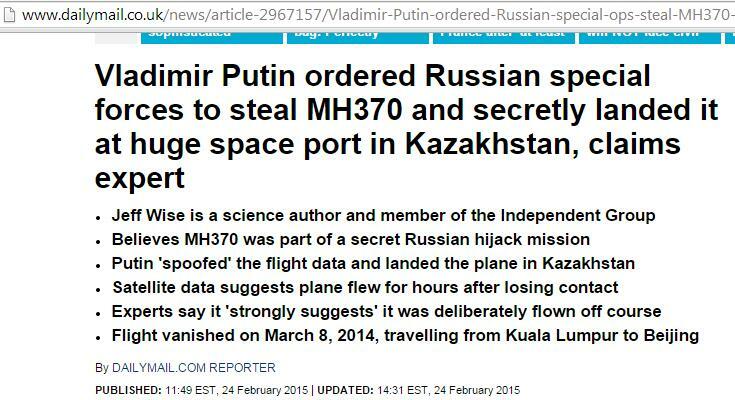 “Why, exactly, would Putin want to steal a Malaysian passenger plane? I had no idea,” Wise confesses. There is nothing wrong with having an opinion, even if it is crazy and not based on evidence or observable reality. Judging by his observations about MH17 and Russia, Wise has clearly fallen victim to what psychologists call confirmation bias – a tendency to see and interpret information in a way that confirms one’s preconceptions. However, almost the entire mainstream press in the West suffers from this when it comes to Russia – prompting several commentators to dub the phenomenon ‘Putin Derangement Syndrome.’ Witness the recent announcement by a “Pentagon think-tank” that Vladimir Putin is supposedly autistic, dutifully reported as fact. Now it seems Jeff Wise’s fantasy is due for the same treatment. As a reminder, when Malaysia Airlines flight MH17 was shot down over the war zone in eastern Ukraine on July 2014, Kiev and the mainstream Western media ignored every single fact of the case in order to blame Russia, and Vladimir Putin personally. British tabloids led the pack, with headlines like ‘Putin’s rebels blew up plane,’ (The Daily Express), ‘Putin killed my son’ (The Daily Mail), and ‘PUTIN’S MISSILE’ (The Sun). When asked about evidence of these charges, the West offered none. And after the Russian military released its own findings about MH17, Western coverage of the shoot down abruptly fell silent. News that the Kiev government actually signed a non-disclosure agreement with the Netherlands, Belgium, and Australia in early August, reserving the right to gag any revelations in the MH17 investigation, did not fit the “blame Russia” narrative – so it was ignored.